Entdecken Sie eine von Großbritanniens lebendigsten Städten am Meer auf zwei Rädern mit dieser 2,5-stündigen Radtour durch Brighton. 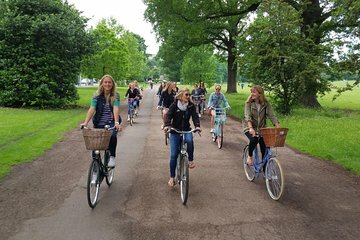 Entscheiden Sie sich für die Tour am Vormittag oder Nachmittag und folgen Sie dann friedlichen Radwege durch Victoria Lawns und die Grand Parade mit Ihrem Reiseleiter. Entdecken Sie die beliebtesten Sehenswürdigkeiten wie Brighton Pier, St Peter’s Church, Preston Manor, Royal Pavilion, Brighton Dome und The Lanes. Genießen Sie die frische Meeresbrise im Gesicht, während Ihr Reiseleiter Ihnen das reiche Erbe der Stadt erklärt, staunen Sie über die fabelhaften Aussicht auf die Küste und baden Sie in der Atmosphäre im Fischerdorf-Viertel. This tour did not dissapoint! Whether your a local or a visitor this is an amazing way to see the city. Carlo, the tour guide, was very knowledgeable and had great recommendations for our lunch. We walked there after the tour and it did not dissapoint. The bikes were comfortable and smooth and i would highly recommend this to anyone visiting Brighton. EXCELLENT TOUR, Carlos, our guide, was extremely knowledgeable, helpful and funny. This was a great cycle tour. Knowledgable and fun operators, felt very safe too riding around the city. Highly recommend. Great way to get around and see the city. Carlos was very informative. Easy pace for all to enjoy. Would have liked to stop at the brick railway bridge near the park for info and some snaps but that is all I could suggest. A great value for money way to see Brighton. A very diverse and informative tour with something for everyone. Lovely and very easy cycling tour around the city. Carlo was friendly and knowledgeable of Brighton's history and iconic spots. We visited some churches, parks, the seafront, and there was a break at a nice coffee shop. He also recommended us a lot of restaurants. The bikes were good too, suitable for all ages. A great way to explore the city. Carlo was knowledgeable and fun and made loads of stops so both the time and the miles went really quickly. I would highly recommend this trip. Fantastic tour, good and clear explanations, very friendly guide, bikes in good shape. Nice way to see Brighton while doing a little sport at the same time.